This is possibly a Roman site, a Romano-British farm, or a Roman stronghold. But there has not yet been a proper excavation. Iron slag dated to the 1st Century AD (during the Roman occupation of Britain) has been found incorporated deep into the castle&apos;s walls. Perhaps future archaeologists will uncover the answer? During the 1100s the Norman Hidon family built a fortified manor house. Initially, this was probably a defensive tower and stockade. Later during the 1200s, a medieval hall was added to the northern side of this tower to form approximately the outline of the current manor house. Subsequently, the Dynhams (originally from Brittany) married into the family. 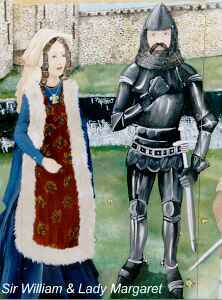 On 5th November 1380, King Richard II granted Sir William and Lady Margaret Asthorpe (née Dynham) a licence to crenellate their fortified manor house, to create a rare late 14th century moated castle. At first sight, it may be hard to imagine Hemyock Castle in its Medieval heyday. Over the years, part of the moat has been filled in to form a farmyard and only fragments of the castle defences remain, but by walking the site and with the help of the exhibits you can soon begin to appreciate how it must have looked. The castle plan is typical of late medieval castles: a rectangular site with high round corner towers and central interval towers, connected by a high curtain wall; all topped with crenellations. Most buildings were of chert, a local flint stone. Two towers at the front, about 13 metres (40 feet) high, formed the entrance Gate house. This housed the portcullis and drawbridge over the moat. The curtain walls, about 7 metres (20 feet) high, were pierced by putlog holes through which beams projected to support the roofed galleries (hourdes). From the safety of these, defenders could fire arrows and missiles, or pour noxious liquids or heated sand onto any attackers who crossed the moat. By the Civil War (mid 1600s), Hemyock Castle and most of Hemyock belonged to the Pophams. It was garrisoned for Parliament and used to imprison Royalists. The Royalist forces attacked twice in 1643/4: The first attack was beaten off and the Royalist commander killed; a few days later, a larger Royalist force returned and captured Hemyock Castle after a short siege. 200 prisoners were released. Three of the garrison were hanged immediately, and the remainder marched off to prison in Exeter. Not long afterwards, it was recaptured and held for Parliament until the Restoration in 1660. According to local tradition, King Charles II ordered that Hemyock Castle be slighted (destroyed), because it had been held against the Royalists. From then, the manor house became a farm and the castle was used as a stone quarry for local buildings. The house was sold without the farm land in the early 1970s. Downloadable version: Hemyock Castle Trail leaflet (252kB PDF format). Follow the numbered locations on the site plan below. In front of you is the medieval manor house with its fine doorway of Cornish granite. Behind you are the two Guard Houses (now self-catering holiday cottages). Between these you can see St. Margaret&apos;s Brook and the Norman tower of St Mary&apos;s Church. This stream used to flow through what is now the farm yard and under the drawbridge where you are now standing, to form part of the moat. 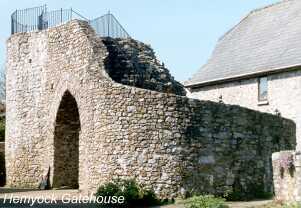 Look back at the Gate house and notice the holes on either side of the archway. These held the beams that supported the drawbridge. Go through the archway, noticing the portcullis slot on your left, and the remains of the older inner archway to the fortified manor house. On your right, you will see the stone mounting block; possibly to make it easier for a knight in full armour to climb onto their horse. Unaccompanied children are not allowed up the tower steps. You may climb the steps up the tower. You do so at your own risk. Please do not allow unaccompanied children to go up. When you reach the mounting block steps, keep to the left, next to the wall, until the iron railings start. Notice the portcullis slot. The portcullis and drawbridge would have been operated from a building above the archway. At the top, look down inside the tower. The square putlog holes held the beams (logs) used as scaffolding during construction, and later used as floor joists. There were no entrances to these two gatehouse towers below about 7 metres, where there would have been entrances from the curtain wall. The lowest levels were probably prisons; the unfortunate prisoners being lowered through a trap door in the floor. Above that, the store rooms, and finally the guards&apos; living quarters equipped with arrow slits commanding the entrance. The high water-table meant that it was not useful to build any chambers below ground. The castle towers were higher than the present church tower, but even at only half the original height, this gate house tower still commands a good view of the surrounding area. Originally, all vegetation within about 150 metres would have been removed, and village houses would have been only one storey high. Marshy land to the north, in the Culm Valley, provided further defence. There were guard posts with a system of passwords on all approach roads. Be very careful going down the uneven steps. At the bottom, walk right, along the side of the manor house, and then turn left past the old bay tree growing on the corner of the house. In Medieval times, these trees were planted on the corners of houses, to keep away evil spirits. We are safe here! The farm dairy was at this end of the manor house. People believed that witches made milk go sour and curdle - another reason for the bay tree. 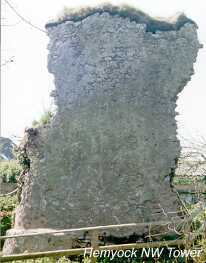 Notice the putlog holes in the curtain wall opposite the bay tree. You may enter the dungeon. This prison is a lean-to built outside the curtain wall (but protected by the moat), so it must be a later addition. It may have been here that the Rev. James Burnard was imprisoned by the Parliamentarians. His story is on the wall. The display cases contain pottery shards found on the site, some dating back to the 12th century, and some from vessels produced abroad. The quality indicates that a prestigious family lived here. It is interesting to note how the pottery changed over the centuries; eg shards from wine jugs and plates used in the Great Hall in Medieval times; then later, cider jugs and cream bowls from the farm. There are also pieces of iron slag which may date from Roman times. See our new display Deep Historic Links with Continental Europe which shows where some of the imported pottery came from, and explains some of the background. Also in the Dungeon, see details of the limited geo-physical survey of the site, including information about the missing western curtain wall & its probable gatehouse. Leaving the Dungeon, turn right along the path, noticing on your right, the outside toilet. Now modernised, it was originally a "family 3-seater". The picnic area is bounded by the ruins of the North interval tower and of the North West tower. Stones indicate the connecting curtain wall. Optional walk at your own risk. No unaccompanied children are allowed down here. Take very great care. The steps are uneven. Hold children by the hand. Although the water is not very deep, beneath it is very deep mud. The moat is now very silted up. In Medieval times, this silt would have been dug out every year and spread on the land. However the site is now a Scheduled Ancient Monument and we are not allowed to do this. There is reputed to be a horse and cart, and presumably much else of interest, at the bottom of the moat. We hope one day to dredge the moat and display any finds. At the end of the moat walk, notice the rendering still remaining on the outside of the NW tower. Originally the outside of all the towers and curtain walls would have been rendered and lime-washed - a most impressive sight! Stones indicate the site of this tower, and the curtain wall running south from it. Go south towards the modern bridge over the moat. You are welcome to view the moat from there, with Chinese and Common Geese, and Mallard Duck. However, take care of children. The bridge is slippery when wet. The stone garden wall is only about 150-200 years old. It has been built over part of the South Tower and uses stones from the original curtain wall. The foundations of this tower were excavated by archaeologists, and then covered over to protect it. They found the original ground-floor entrance to this tower, including the slot for the wooden post which held the door. It is likely that all the entrances were like this. This building was formed out of the old Carpenter&apos;s Shop. It was in here that cider barrels were made. The Carpenter&apos;s Shop was built over older buildings. Human skeletons are reputed to have been discovered under this floor. 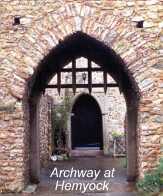 Enter the through the old arched doorway and imagine that you are in a Medieval building. Old windows from the manor house have been hung along the walls. Through them you can see a local artist&apos;s impressions of scenes depicting various aspects of the history of the site. On your right, the very old timber on the floor supporting the "screen", is probably the base of the original screen that helped keep the draughts off those in the Great Hall in Medieval times. This timber must have been a well grown Oak in 1066 when William the Conqueror landed at Hastings. 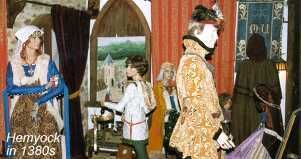 Follow the numbered exhibits and life-sized tableaux around the centre and imagine yourself back in the times when the characters were living at Hemyock Castle. The model of the castle has been constructed recently by a local craftsman, based on careful research. It portrays the original 1380 castle. Note the rendering and lime-wash on the walls. General John Graves Simcoe owned much land at Dunkeswell, and lived at Wolford Lodge. There is a small display relating to him. He was Governor of Upper Canada, where he is still greatly revered. Although General Simcoe had a life packed with action and adventure, his dream was to restore Hemyock Castle to its former Medieval glory. He did some work here, reputedly with the help of French prisoners of war, but died before he could achieve his ambition. He was convinced that this was a Roman site. Peter Orlando Hutchison visited here in the mid 19th century. See the copies of his paintings. He, like Simcoe, would have liked to have seen Hemyock Castle restored. If you would like to read more about the history of Hemyock castle, there is a history on sale at the Reception Hut. Postcards of Orlando Hutchison&apos;s paintings, and tea towels which embody local scenes are also available. Here notice the old farm buildings. Under the old stone steps, is the traditional dog kennel where farm dogs would have slept. The sheds have been formed out of the old open linney (linhay). The animals were kept below, and their fodder above. Notice the metal lined door. This is where the Castle Farm boar lived. Apparently he was very fierce so the door had to be lined with metal to keep him in! Cider was very important Part of the farm labourers&apos; wages was paid in cider, so it was very difficult to retain good labourers on a farm unless good quality cider was made. On Castle Farm, cider was made in the Southern end of the farm house, using animal power to drive the machinery via a series of belts and shafts. This cider press dates from the mid 18th century and originally had twin wooden screws. During the early 19th century it was improved by the installation of a single iron screw. To the left of the cider press is an apple mill. This was bought in the mid 19th century to chop apples before they were tipped into the press. The old wooden staircase used to be in the cider house. The enormous cider barrel was made in the Carpenter&apos;s Shop. After making such barrels, they were rolled between the Guard Houses, and down into the stream to swell the wood. The car ports were originally cow parlours where the cows were milked. The remaining parlour contains a 20th century wartime display including Land Army items, and traditional farm implements. We do hope that you have enjoyed this brief tour. Excerpts from Hemyock Castle Guide Leaflet, ©1996, Richard Sheppard. Declaration of The Rights of Man.